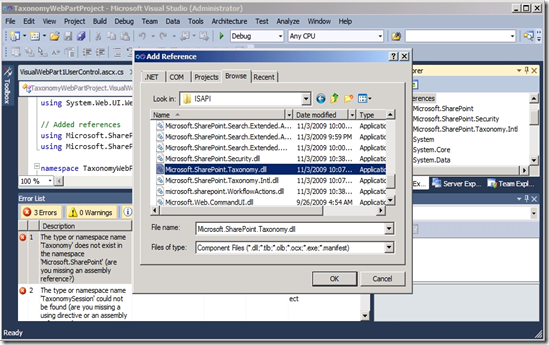 If you’re wondering how to organize your SharePoint 2010 Enterprise Managed Metadata (EMM), you should start by reading the TechNet article, Plan terms and term sets (SharePoint Server 2010). I’m going to highlight some of the key points of that article and also add a few points from other sources. While the TechNet article reminds us that you could simply allow your users to add keywords and then use their input to create your taxonomy—promoting keywords to managed terms—it seems likely that most organizations will want to start with an organized metadata hierarchy. As explained in SharePoint Taxonomy Part One – Introduction to SharePoint Managed Metadata, the SharePoint 2010 EMM is organized into a hierarchy. The objects within this hierarchy are term stores, groups, term sets, and terms. Note: Keywords are stored in a non-hierarchical fashion in there own storage space. • When a Managed Metadata service is created, a term store will be created. Once you have a term store, you can create a group. A group is a security boundary. • Once you have a group, you can create a term set. A term set must be the child of a single parent group. • Under a term set, terms can be created. A term can be the child of a term set, or of another term. • A term can be added as a child of another term. One of the key points of the TechNet article about planning your terms and term sets is that a group is a security boundary. 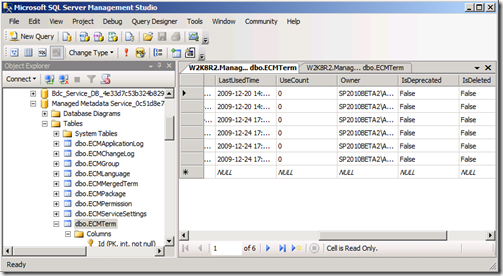 A group contributor can manage the term sets in the groups and create new term sets. All users who have access to a term set under a group can see all of the other term sets—even if they don’t have rights to manage the other term sets. Based on this, you should organize your term sets into groups based on the groups of users who will manage them. For this reason, your taxonomy may correlate to your organizational structure. Let’s take a look at an example. 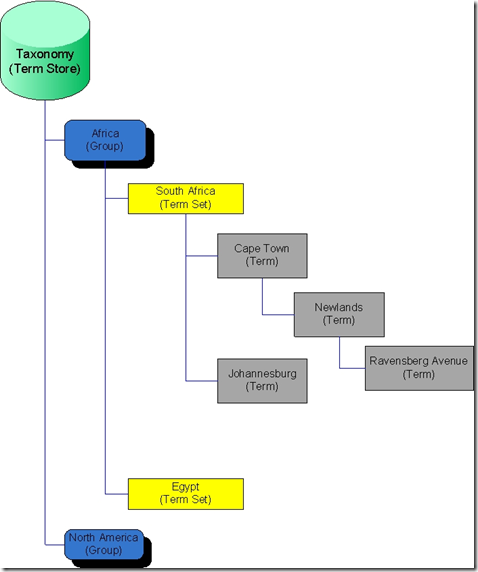 Term Store: In the sample hierarchy shown in the figure above, you can see that there is one term store (called “Taxonomy” for lack of inspiration for a better name). 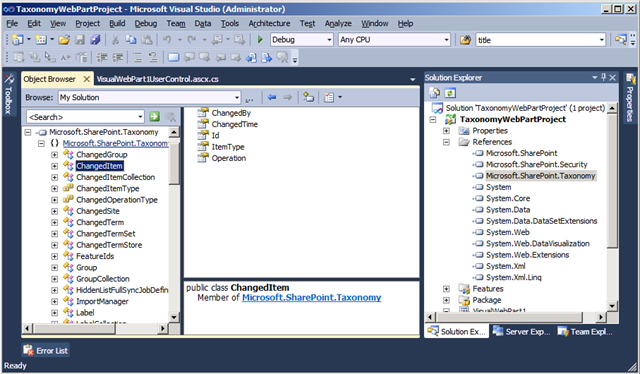 Remember that you can have multiple terms stores, but each term store is stored in a separate SQL Server database. Group: Under the term store are two groups: Africa and North America. The idea is that these could be significant geographical locations to this particular fictional organization. Remember that the groups are a security boundary, so the users assigned to the Africa group don’t have to have any access to the Egypt group. However, if users are given rights to a term set under one of the groups, they will be able to see the names of all the term sets under that group. Term Set: Inside the Africa group there are two term sets: South Africa and Egypt. Terms: At the top level, the South Africa term set contains the terms Cape Town, Johannesburg and Joburg. Terms can be nested seven levels deep. In this case, the Cape Town term contains the child term “Newlands” (a neighbourhood in Cape Town), and that term contains the child term “Ravensberg Avenue” (the street I lived on in Cape Town). - You can specify a custom sort order for terms, so it isn’t necessary to show them in alphabetical order. 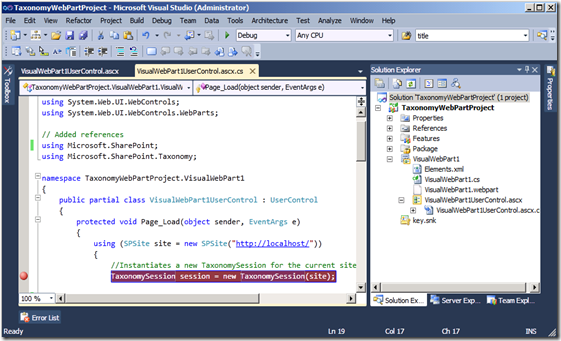 - Term sets can be open or closed. Open sets allow all users to add terms. Terms can only be added to closed sets by users who are contributors to the group. - In addition to terms, SharePoint 2010 EMM contains keywords. Keywords aren’t restricted, so they can be used informally to create “folksonomy,” but keywords can be promoted to managed terms. If you’ve been tasked with creating the taxonomy for your EMM hierarchy, keep these points in mind, but I strongly recommend that you also take advantage of the articles and the worksheets available on TechNet. 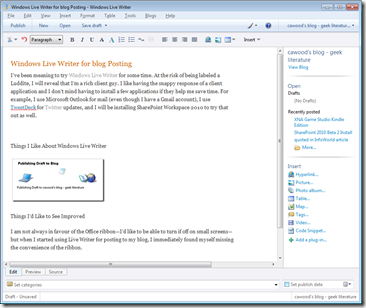 Over the last few weeks, I've found that I'm unable to paste text into the blogger web editor. This problem was actually the final straw that drove me to try Windows Live Writer for blog Authoring--which BTW is working out splendidly and I'm happy that I finally gave it a shot. To run a webpage in IE7 mode in IE8, open Tools –> Developer Tools (or use the F12 key) to launch the developer tools window. And since images are so easy to work with in Windows Live Writer, I'm going to save this draft and paste in a screenshot using Live Writer. 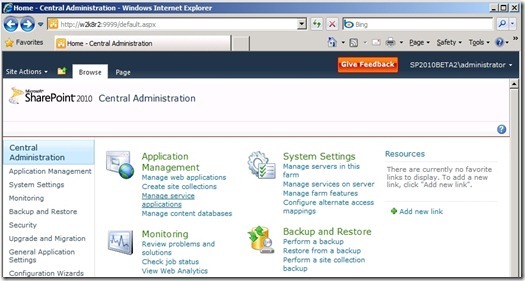 This post is part four in a series that I’m writing about SharePoint 2010 Enterprise Managed Metadata (EMM or ‘taxonomy’). If you haven’t set up a SharePoint 2010 development environment yet, you may also want to check out SharePoint 2010 Beta 2 install. 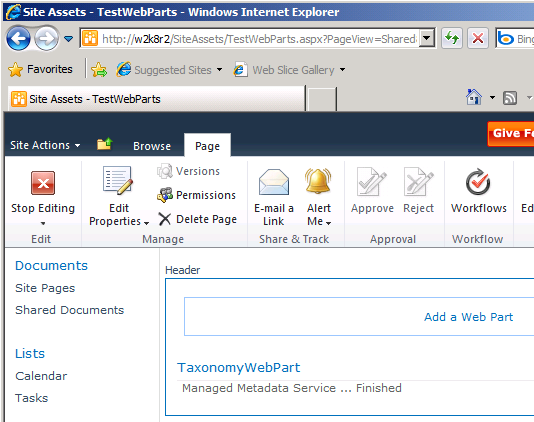 Update: I have posted a video demo on the Metalogix blog showing how to create a SharePoint 2010 Taxonomy Web Part. 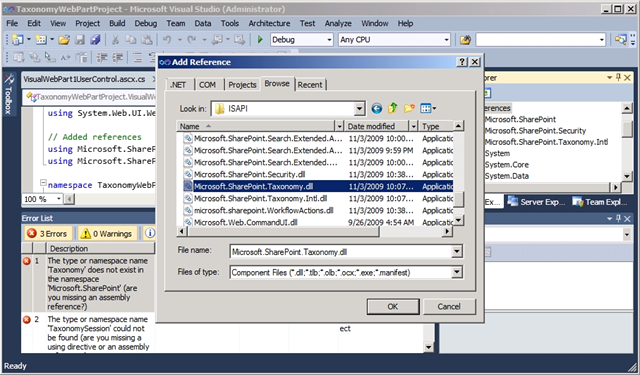 Opening Microsoft.SharePoint.Taxonomy in the Visual Studio Object Browser reveals a long list of objects, but you won’t need to worry about a number of them. In this post, I’m going to start with the most useful and then add others if I find that they’re worth covering. 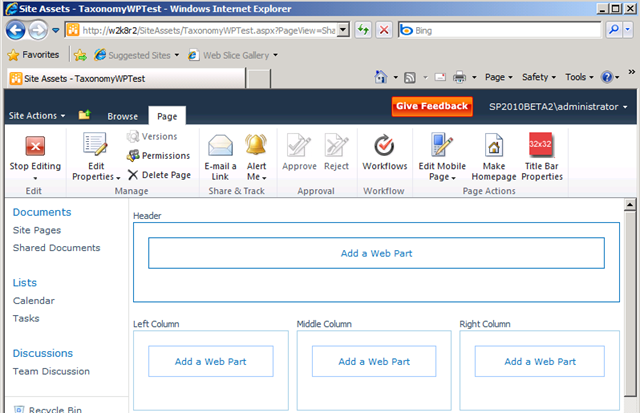 I’m going to continue with the example I started in SharePoint 2010 Visual Web Parts, but don’t worry if you’re not interested in building a web part, I just happened to choose that as the example. You can use the same code from a number of different places (e.g., a Windows Form application). I won’t be covering remote access to the taxonomy API in this post since that will topic is worthy of its own attention. 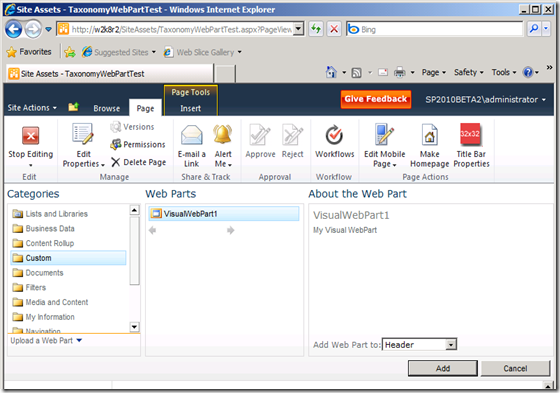 The starting point for this conversation is VisualWebPart1UserControl.ascx.cs from the simple web part example. 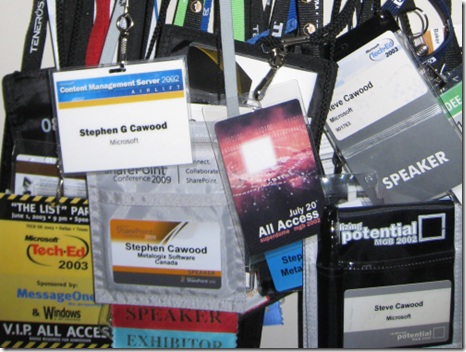 I covered issues adding the references in SharePoint 2010 Taxonomy Reference Issues. 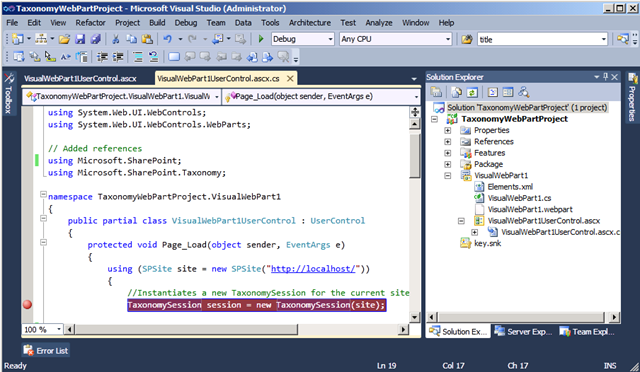 As you can see, this is a pretty straightforward example of how to get a TaxonomySession object and employ it. Once loaded, this web part will immediately write out the names of each term store available on the server. So let’s break it down. The first thing that happens inside the Page_Load method is getting an SPSite object. 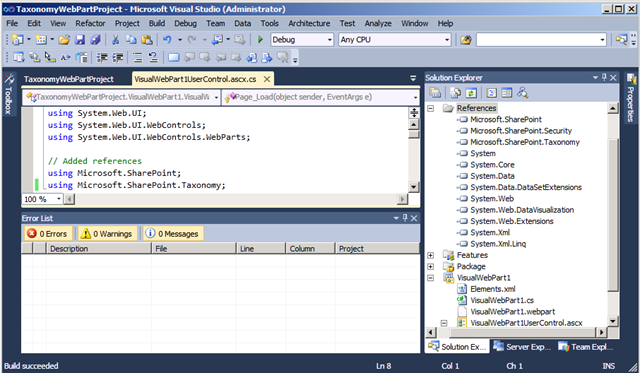 As mentioned above, TermStore objects are associated with the Web application of the parent SPSite object. By running the code within a using statement, you can rest assured that dispose() will be properly called on your objects. Since this web part project is using the SharePoint Visual Web part template, the only references I had to add were Microsoft.SharePoint (for the SPSite object) and Microsoft.SharePoint.Taxonomy (for the taxonomy objects). Now that you have a taxonomy session, you can start to use the taxonomy classes. In this case we’ll loop through each available term store on the server and write the results to a label. 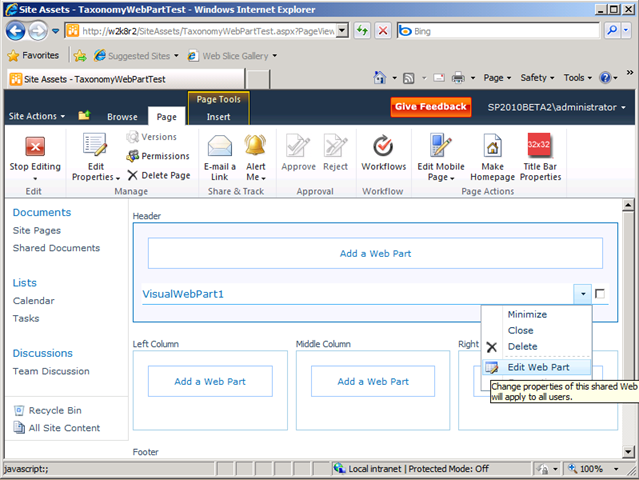 The label was simply dragged onto VisualWebPart1UserControl.ascx from the Toolbox onto design view for the web part. Pressing F5 will start the debugger and allow you to run the code as described in SharePoint 2010 Visual Web Parts. In this case, there is only one term store, so only one name is returned. It’s a simple example but useful since you will need to know the name of your term store before you instantiate a term store object and start reading from or writing to your taxonomy. Message=Specified argument was out of the range of valid values. As explained in SharePoint Taxonomy Part One – Introduction to SharePoint Managed Metadata, the SharePoint 2010 EMM is organized into a hierarchy. The objects within this hierarchy are term stores, groups, term sets, and terms. For more info about the EMM hierarchy, refer to my SharePoint Taxonomy Hierarchy post. • When a Managed Metadata service is created, a term store will be created. Once you have a term store, you can create a group. 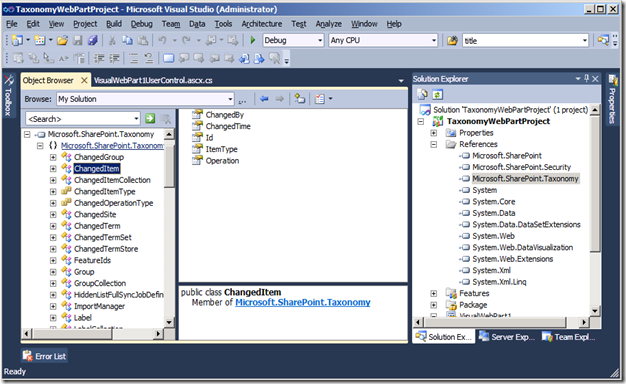 The Taxonomy API cannot create a term store (it is done through Central Administration or with a PowerShell script). However, the rest of the EMM containers can be created using the Taxonomy API. • After a Group object is created, the first TermSet object can be created. A TermSet object must be the child of a single parent Group object. 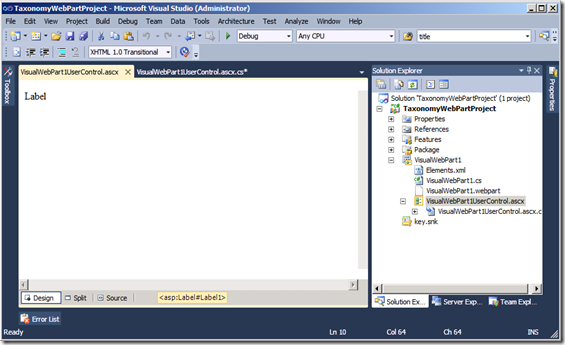 • After a TermSet object is created, the first Term object can be created. 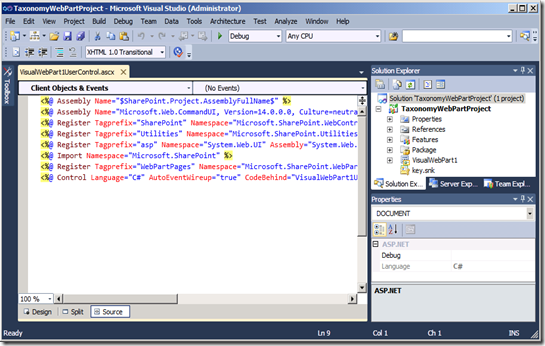 A Term object can be the child of a TermSet object, or of another Term object. • After a Term object is created, another Term object can be created and added as a child Term object. Let’s start with the last one first: the CommitAll method. After performing write operations to a TermStore object, you must call CommitAll to commit the transactions. The taxonomy API is transactional so either every operation will be successfully committed, or none of the changes will be applied. As you saw in the list of classes above, the object model also includes changes. For example, ChangedItem and ChangedGroup. These are used to record what has happened. The SetDescription method allows you to create a description for the term and you can use CreateLabel to create synonyms. You can choose whether the label will be the default using a true or false Boolean. Of course, the Delete method will delete an object. 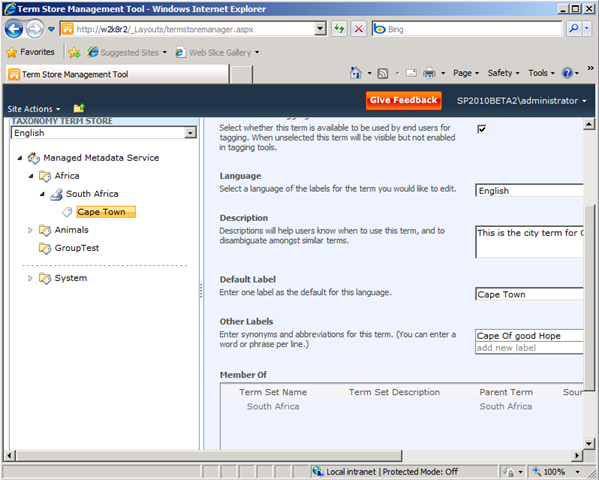 Note that when creating a term or label, EMM provides the ability to supply the same term in different languages. This provides a number of multilingual features, but it also means that you’ll need to supply a Locale Identifier (LCID) when using some of the create methods. Windows uses the LCID to choose the language and culture when displaying information. The ID for English is 1033. //Instantiates the connection named "Managed Metadata Service" for the current session. To help organize my time, I’m going to get started on my conference list early this year. I don’t have many details about which conferences Metalogix will exhibit at, or where I’ll be speaking, but at least I can put the dates in my calendar. I’ll add the missing information when it’s available. I'll be speaking about SharePoint 2010 Managed Metadata (taxonomy) at SharePoint Saturday in New York (#spsnyc) on January 30th. 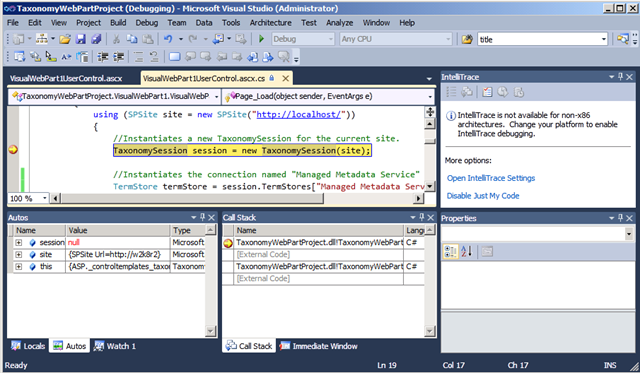 I’ve been digging into the new taxonomy features and I’m looking forward to showing off some code. If you’re looking to use the new SharePoint 2010 Managed Metadata (Taxonomy) API, you will likely run into one or both of these issues. One of them is mentioned in the known issues for SharePoint 2010 Beta 2, but not in a way that’s conducive to finding the solution with Bing or Google, so I’m including it here as well as a new one I’ve stumbled across. The first issue is that after adding the Microsoft.SharePoint.Taxonomy reference, your project will not recognize any of the taxonomy classes (e.g., TaxonomySession). The first thing that I noticed is that adding the reference to Microsoft.SharePoint.Taxonomy from the .NET reference list simply did not work. Instead, I got a reference to Microsoft.SharePoint.Taxonomy.Intl—which is obviously a different DLL. To resolve this issue, I simply used the browse option and added the right DLL explicitly from: C:\Program Files\Common Files\Microsoft Shared\Web Server Extensions\14\ISAPI\Microsoft.SharePoint.Taxonomy.dll. I deleted the other Taxonomy reference just for clarity. 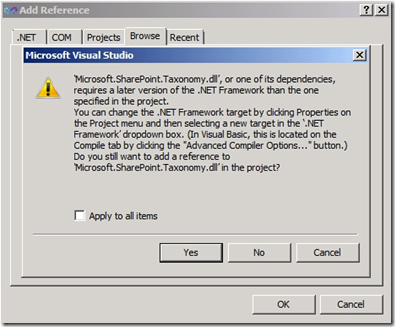 When you add the right version, you may see the error: “’Microsoft.SharePoint.Taxonomy.dll’ or one of its dependencies, requires a later version of the .NET framework than the one specified in the project. 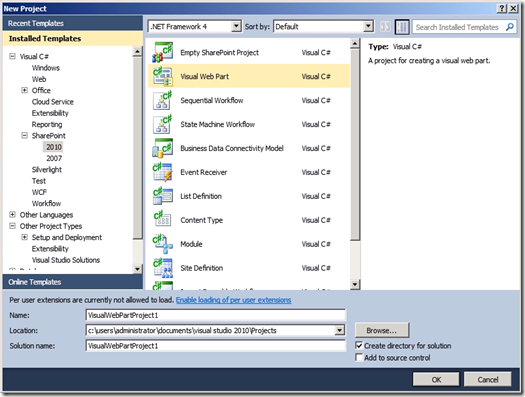 You can change the .NET Framework target by clicking Properties on the Project menu...” You can ignore this error (you want to use .NET 3.5), it is resolved by the next solution. 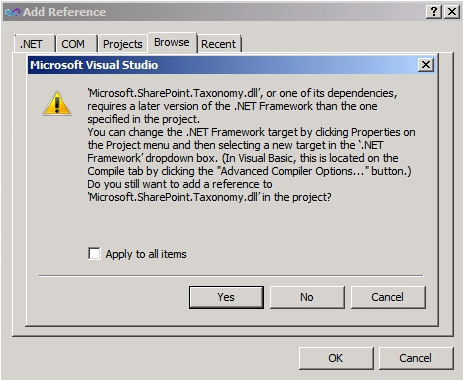 Evidently, Microsoft.SharePoint.Taxonomy is another one of the assemblies with this issue. Fortunately, the solution is straightforward. Simply add a reference to System.Web.DataVisualization using the path above and your problems are solved. 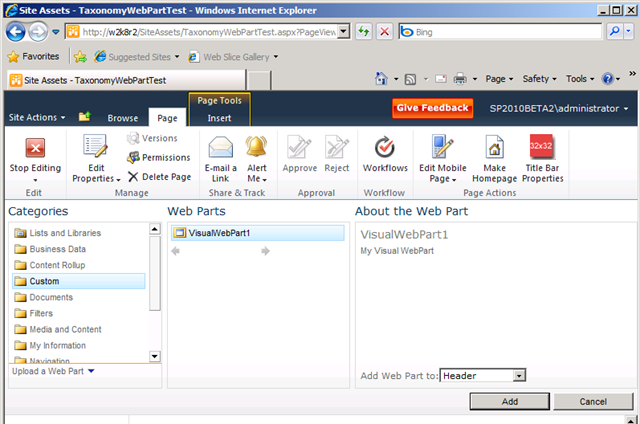 One of the new features in SharePoint 2010 that I’m most excited about is the ease with which developers can now create web parts. 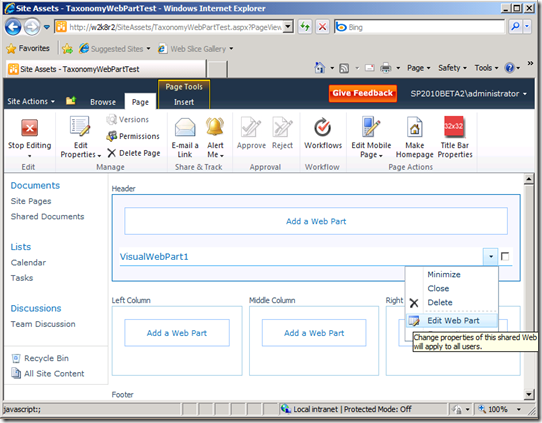 To distinguish the old from the shiny new, SharePoint 2010 provides the “Visual Web Part” project type. In this post, I’ll quickly cover the basics of getting a new web part working in debug mode--I’ll get into more detail in future posts. 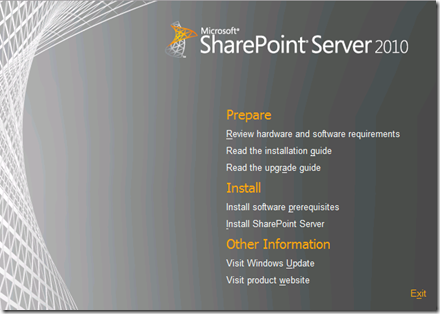 Obviously, you’ll need a working SharePoint 2010 development machine, so if you don’t have the set up yet, I suggest you refer to my post about SharePoint 2010 Beta 2 Install. 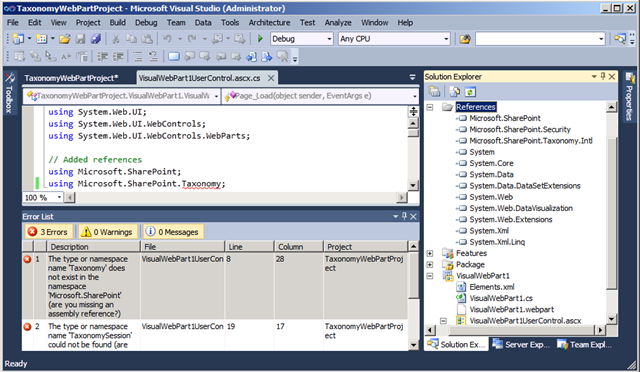 Once you have everything set up, the first step is to create a new project in Visual Studio 2010 Beta 2. 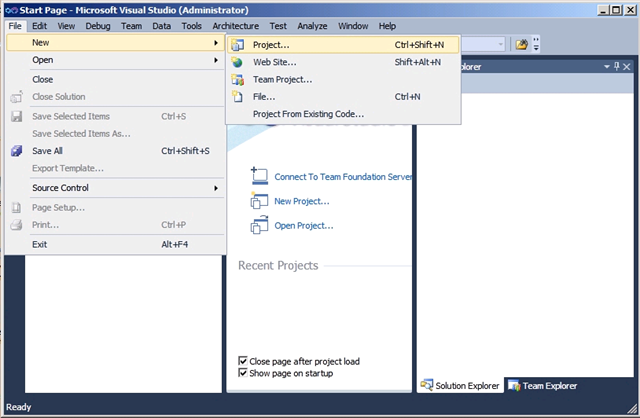 The new project dialog gives you the ability to choose a myriad of project types. You’ll want to choose Visual C# > SharePoint 2010 > Visual Web Part. 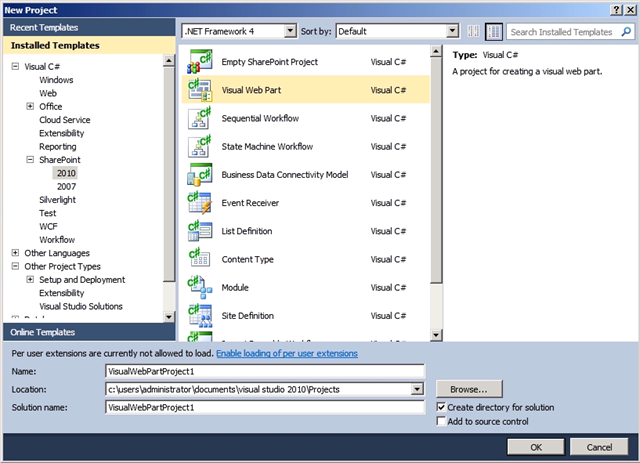 As usual, you also have the option of choosing a project name, the path for the project files and a solution name. When the project is created, you will see that the plumbing of your new web part is provided in the project template. Rather than dive into the code, we’re just going to get this blank web part running, so start the debugger (F5 or click the green arrow). At this point, you’ll be asked to create a web part page to associate with your web part. 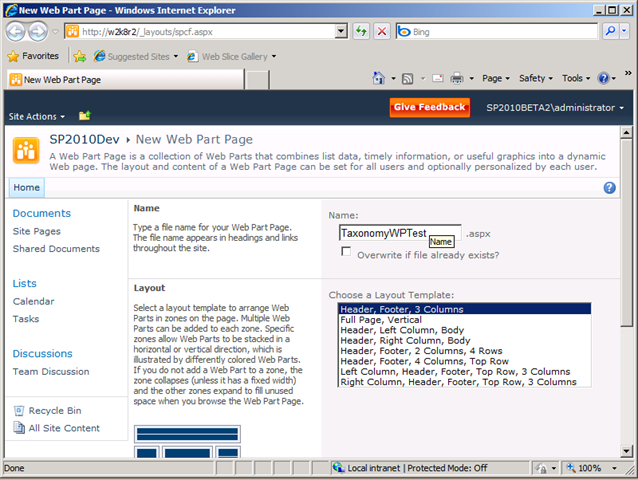 After you choose a name and template for your new web part page, you can save your choices and the page will be created. Note: The good news is that if you delete this web page, you will be asked to created another when if you choose to debug your project again. The bad news is that it appears that overwriting the page may be necessary--even if you don't delete the first page. Update: Thanks to Peter Holpar who pointed out that I neglected to mention that you can add the debug page URL (once you've created it) into the Debug option of the project properties. This saves the extra steps of creating the page for each subsequent debug run. 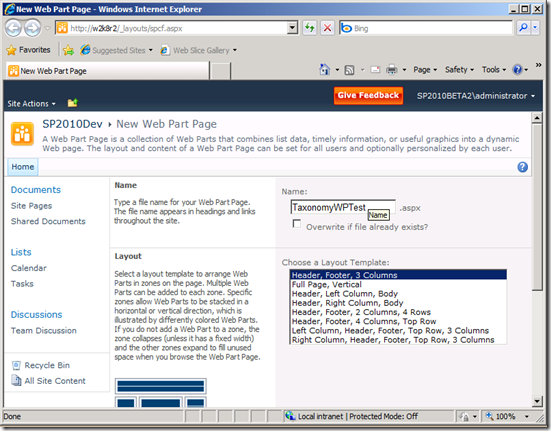 Depending on which template you choose, click an area where you see “Add web part” to bring up the web part picker. If you chose the default web page template, you will see four options. You’re new web part will appear in the “Custom” category. After you choose to add it, you’ll see the name appear on your web part page. And that’s it. You now have a blank web part project that you can use to build what you want. Sure, it doesn’t actually do anything, but just enjoy how simple it is to get a working web part running in debug mode on your SharePoint server. 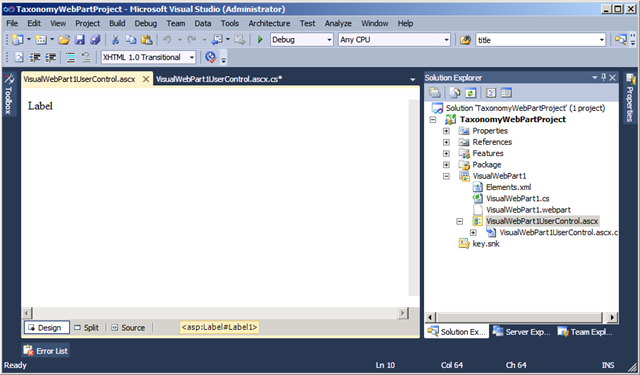 Now you can drag and drop controls from the Toolbox just like any other ASP.NET page and start your creation. One of the new advances in web part goodness is ease of debugging. To see how easy it is to debug and step through your code, simply insert a breakpoint into your visual web part. When you now run the debugger, code execution will stop at your breakpoint and let you step into/over or do whatever you desire in debug mode. Now the trick is to figure out what you want to do, but isn’t that better than worrying about the plumbing? When you install SharePoint 2010, a managed metadata service called “Managed Metadata Service” is created for you. This term store maps to a SQL DB that begins with the same name. However, if you go to the Term Store Management Tool (through Central Administration or Site Settings), you’ll find that you don’t have any options to create or manage terms. The reason for this is that you need to add yourself to the administrators group for the managed metadata service. After you add yourself and save the changes, you’ll be able to create groups, term sets and terms. At this point, you can try to tag SharePoint content. If you open a list and try to tag something, and you see the message, “This control is currently disabled. You might not have the right permission level to use this, you might need to select an object or item, or the content might not work in this context,” then you either have a rights issue, or another problem with your server. 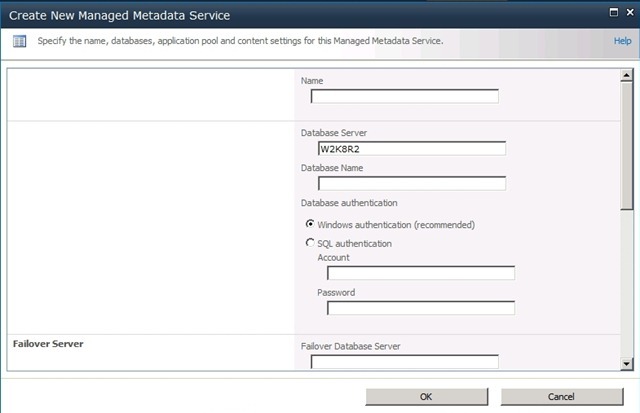 If you want to create your own term store, you’ll need to follow the steps below to create a new managed metadata service. Creating a SharePoint 2010 Managed Metadata Term Store is covered on TechNet, but I’ll be delving into Managed Metadata development in a future post, so I figure I should cover the basics as well. 1. 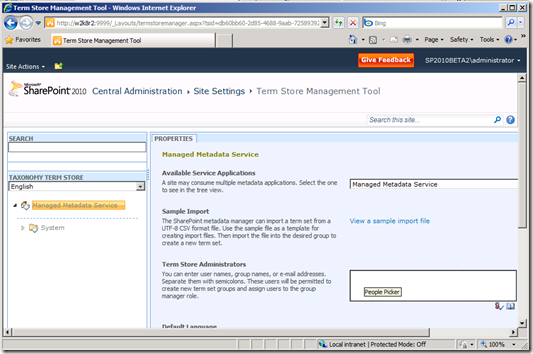 First you’ll need to open SharePoint 2010 Central Administration and select Manage Service Applications from the Application Management section. 2. At this point, the Service Applications tab should be selected at the top of the page. Next, click the dropdown arrow under New and and click on Managed Metadata Service. 3. 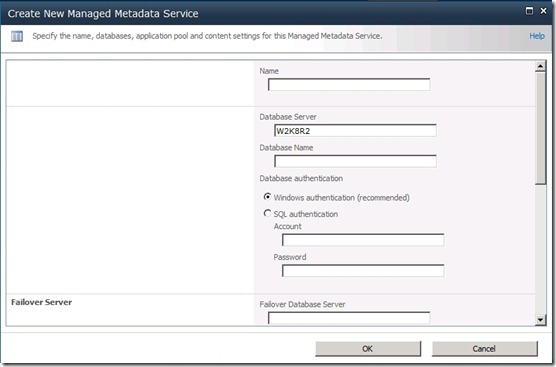 This opens the Create New Managed Metadata Service dialog. Name: This is simply the name of your new managed metadata service. Database Server: Name of your database server. Database Name: The database on the selected server you wish to use. If the DB does not exist, it will be created. Database authentication: The recommended option is Windows authenticated, but SQL authentication is also available. 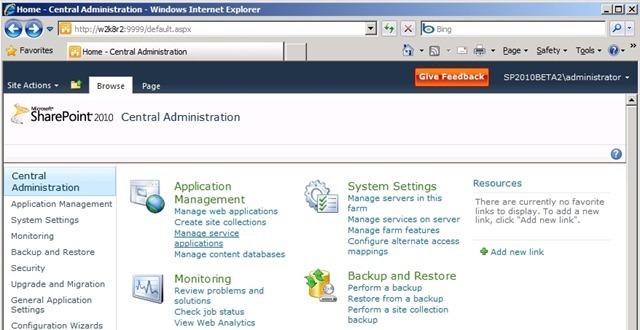 Failover Database Server: If you’re using a failover DB server, you can enter it here. Web Application Pool: You can either create a new pool or choose an existing one from the dropdown menu. Note: Ensure that the selected application pool is actually running before you try to use your term store. 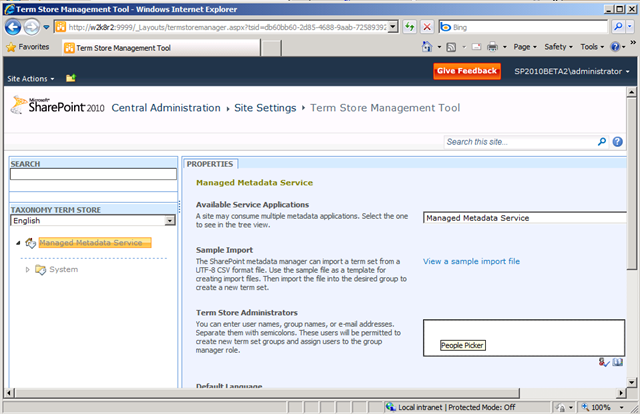 From the same area of central admin, you have the option to perform numerous other operations on your term store. 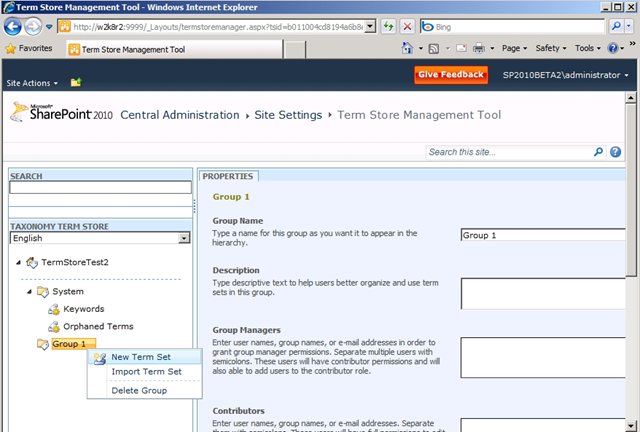 For example, delete a term store, modify the term store permissions, add term store administrators, etc. I have the day off and as I ate my brown sugar Mini-Wheats, I naturally came to the conclusion that today would be the day that I would finally begin to write a series of blog posts about the biggest new SharePoint 2010 feature: Enterprise Managed Metadata (a.k.a. 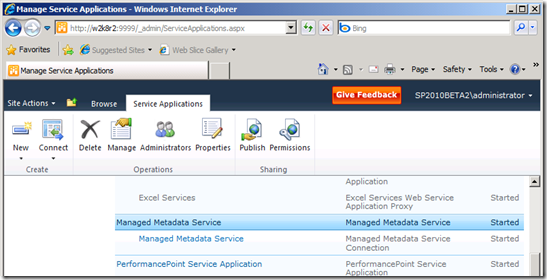 EMM, Managed Metadata Service (MMS) or SharePoint 2010 taxonomy). Back in 2005, I’m pretty sure I was one of the SharePoint Program Managers most disappointed when we learned that taxonomy wasn’t going to make the cut for Microsoft Office SharePoint Server 2007 (MOSS). I didn’t work on the specs, but I believed quite strongly that it needed to be built. It wasn’t a huge surprise that it got cut though. The Enterprise Content Management (ECM) team had plenty of work to do—mainly focused on providing Microsoft Content Management Server (MCMS) features in SharePoint. However, with the MOSS release out the door and MOSS for Internet sites popping up all over the Internet, it was time to tackle taxonomy. I know it was a Herculean task, so I tip my cap to my old friends on the SharePoint team who have made it a reality in SharePoint 2010. 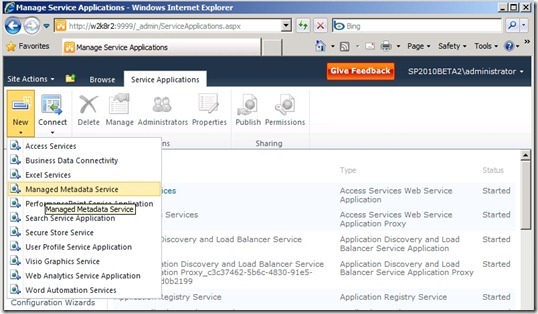 Why is taxonomy arguably the most important new feature in SharePoint 2010? Hasn’t SharePoint always had metadata? There are many useful tagging features in the new release, but another important aspect is the potential unlocked by the new infrastructure. As a Microsoft PM, I heard a clear refrain from customers and partners. I’ll paraphrase it in this way: “Sure, we’d like you to do everything, but we know you can’t. Please just give us the foundation so we can do what’s necessary for our business needs.” [Pardon the SharePoint Foundation pun.] By adding the managed metadata service plumbing to SharePoint, customers and partners have the opportunity to use and extend the taxonomy system. Managed metadata facilitates more consistent use of terms, as well as more consistent use of the managed keywords that are added to SharePoint Server items. You can pre-define terms, and allow only authorized users to add new terms. You can also prohibit users from adding their own managed keywords to items, and require them to use existing ones. Managed metadata also provides greater accuracy by presenting only a list of correct terms from which users can select values. Because managed keywords are also a type of managed metadata, even the managed keywords that users apply to items can be more consistent. As users apply managed terms and keywords to items, they are guided to terms that have already been used. In some cases, users might not even be able to enter a new value. Because users are focused on a specific set of terms, those terms—and not synonyms—are more likely to be applied to items. Searching for a managed term or a managed keyword is therefore likely to retrieve more relevant results. 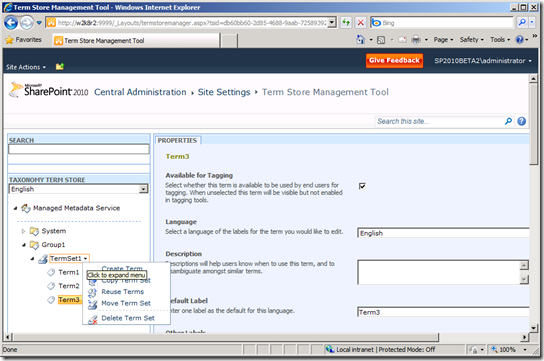 A word or phrase that can be associated with an item in SharePoint Server 2010. A collection of related terms. A term that can be created by users only with the appropriate permissions and often organized into a hierarchy. Managed terms are usually predefined. A word or phrase that has been added to SharePoint Server 2010 items. All managed keywords are part of a single, non-hierarchical term set called the keyword set. A database that stores both managed terms and managed keywords. 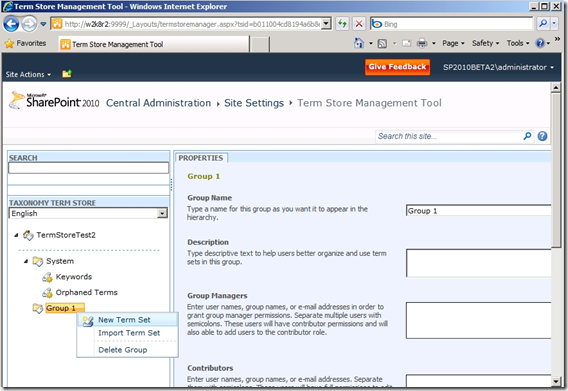 In the term store, all term sets are created within groups. In other words, group is the parent container for term sets. 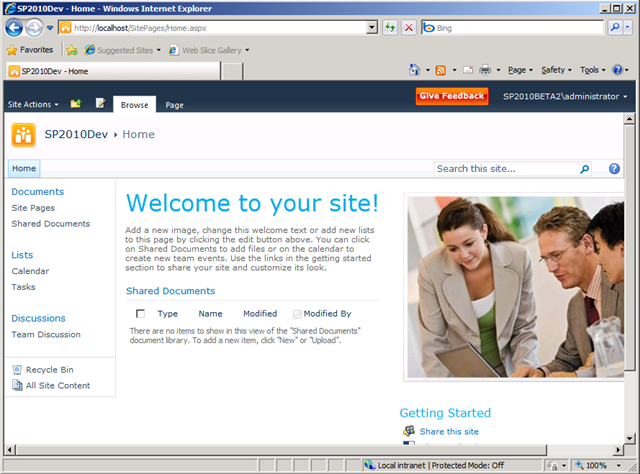 SharePoint 2010 will provide SharePoint users, administrators and developers with the UI and API required for the first two. This means that faculties such as centrally managed terms, folksonomy and tag clouds (social tagging) are enabled. The third type—that SharePoint 2010 will not be offering—is ontologies. Here’s a quick discussion of each type. SharePoint taxonomy will allow synonyms and preferred terms. Synonyms allow a central understanding that LOL is the same as “laughing out loud,” and preferred terms specify which of the two should be used. The other side of the equivalence coin is dealing with words with more than one meaning. To help disambiguate terms, SharePoint term descriptions show in a tooltip so that users can differentiate between G-Force (the recent movie featuring a specially trained squad of guinea pigs) vs. G-Force (my favourite childhood cartoon) from Battle of the Planets. A central repository of terms enables consistency across users. Providing a hierarchy allows for information architecture and organization. In the SharePoint Term Store Management Tool, users with sufficient permissions will be able to perform many operations on terms in the hierarchy. These include: copying, reusing, moving, duplicating (for polyhierarchy), deprecating, and merging. 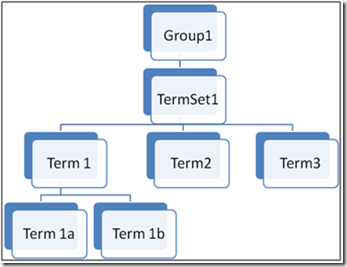 The hierarchy is broken down into a term store at the top, then a group, term sets, and finally, managed terms. Note: managed keywords (or just keywords) will be stored in a separate single database. Keywords will be used for social tagging such as tag clouds and folksonomy, but keywords can be promoted to managed terms. An ontology is a means of classifying data based on an associative relationship. There are endless possibilities for these types of relationships. For example, I could have a hierarchy of terms in SharePoint 2010 that includes the terms “ball” and “bat” as children of the term “sports equipment.” An ontology would allow me to also create a relationship between “Bouncy things” and “ball” because they are conceptually related. Why didn’t the SharePoint team add ontologies? That’s a reasonable question, but the fact is that it simply may not have been worth the effort to tackle such a specialized function when they were already trying to build an ambitious feature. Also, many people wonder if anyone but a library scientist or a taxonomist will complain. How will SharePoint taxonomy be used? Obviously, the most popular end-user use of EMM will be taxonomy to fulfill business needs and social tagging. Many content types will ship with a Managed Metadata data-type column and users will be able to tag their list items, documents, etc, with shared terms. 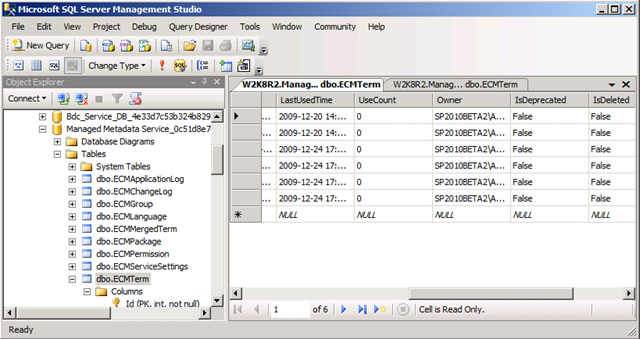 This end-user associated metadata will then be used to classify, organize, find and share information within SharePoint. By tagging external pages, users have a way to add links to their favourite browser’s bookmarks. However, another aspect of the new managed metadata functionality is how it could be used for enhanced navigation and search. For example, terms can be used to enable more advanced parametric search features, targeted search and possibly even lemmatisation in FAST search—but I’m not a search expert, so I’d have to do some more research to find out what’s happening on the search side. One thing is for sure, customers and partners will find interesting ways to use the taxonomy framework. In terms of navigation, the ability to alter the way you navigate your data based on tags is also referred to as faceted navigation. When I was working on SharePoint navigation, we nicknamed faceted navigation, “navigation goggles.” The idea being that you could choose different types of navigation the same way you can shift between song view, albums or artists on many MP3 players. 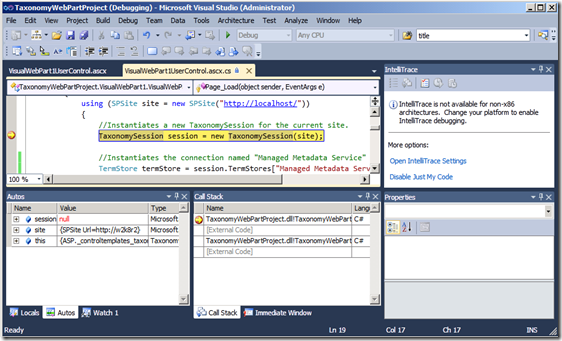 For developers, SharePoint 2010 EMM also includes the Taxonomy APIs. Most of the EMM classes are found in the Microsoft.SharePoint.Taxonomy namespace. 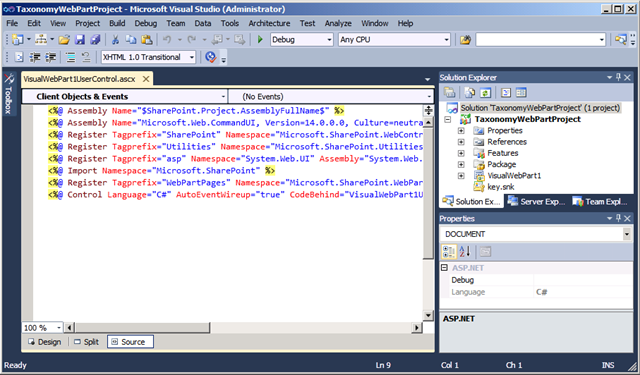 This block of sample code (courtesy of Microsoft) shows how the taxonomy API can be used. //Connection" for the current session. // members of termSet1. Term1a and Term1b are children of Term1. 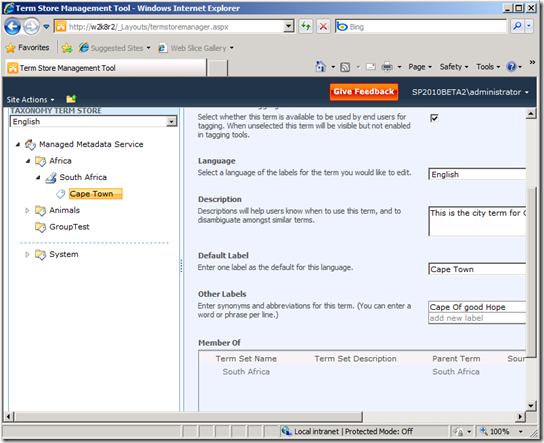 In the Enterprise Metadata Management documentation it states that Managed Terms could be used when metadata "Can be applied in one language, but might be viewed in other languages"
This is available in term stores because Managed terms can be assigned multiple labels. When someone types in any of the labels (which could be in different languages), they will be applying the same term. This creates a multilingual term system. 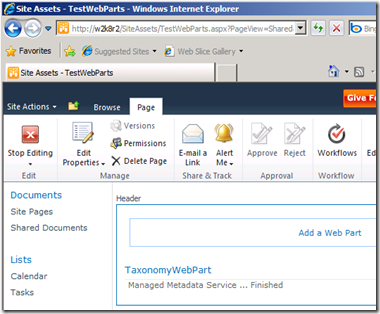 The new SharePoint 2010 Managed Metadata functionality is exciting and provides a framework to build more taxonomy features. Through managed metadata, SharePoint users gain access to functionality such as folksonomy, social tagging (tag clouds) and more powerful search options. EMM also provides a way to centrally manage bookmarks. 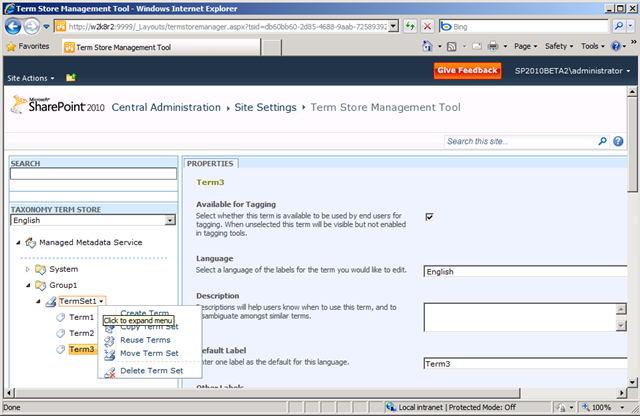 The Term Store Management Tool available in Central Administration (and Site Settings) enables administrators to manage a central vocabulary of terms for the whole farm. Operations that administrators can perform on the term hierarchy include copying, reusing, moving, duplicating, deprecating, and merging. Furthermore, having a managed repository enforces consistency across users. Enterprise Metadata Management is a huge topic. In fact, how SharePoint 2010 exposes the taxonomy features (e.g., the new tag cloud web part) is worthy of its own post, so I’m not going to try and sum it all up in one. “That UBC even has a pep song – let alone a newly recorded one – may prompt some surprise. University fight songs are rare in Canada, where the tradition isn’t held as dear as in the United States. At UBC, an older version of Hail UBC that’s been kicking around since the 1930s wasn’t even suitable to be played over the loudspeakers at games. 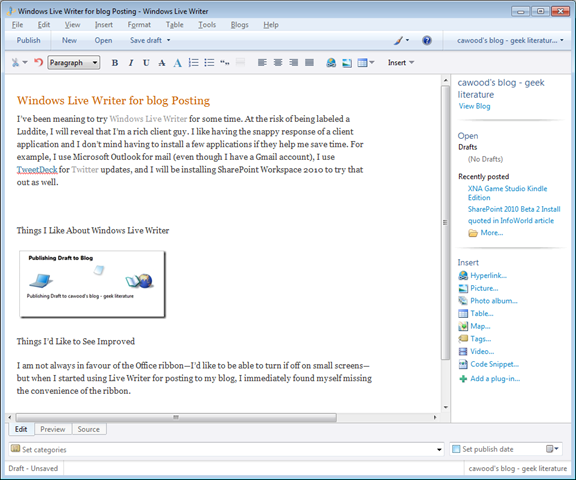 I’ve been meaning to try Windows Live Writer for some time. At the risk of being labeled a Luddite, I will reveal that—when it comes to authoring--I’m a rich client guy. I like having the snappy response of a client application and I don’t mind having to install a few applications if they help me save time. I fully appreciate having online access to SharePoint, e-mail and other assets, but when it comes to authoring, I like to be offline and take my time. For example, I use Microsoft Outlook for mail (even though I have a Gmail account), I use TweetDeck for Twitter updates, and I will be installing SharePoint Workspace 2010 to try that out as well. Image Management: The first killer feature I discovered in Live Writer is the image management capabilities. For my own overly cautious backup reasons, I upload all of my blog images to my own FTP server. This means that even if there was an issue with the server, I would still have a neatly filed copy of every image that I could quickly reference and use for other purposes. I didn’t want to just blindly upload my images or squash them all into a single FTP folder. I was happy to discover that Live Writer allowed me to add my FTP server credentials and every time I publish a post, the images are neatly filed into one folder for each post. Publishing Flexibility: The most fundamental feature of Live Writer is the ability to write content for different publishing targets. At this time, you have the options to add accounts for these platforms: Windows Live Spaces, SharePoint blogs, Blogger, WordPress, TypePad and other blogging sites. Once I created an account for my blog, I can happily work on my post offline and publish it whenever I want. My blog supports taxonomy categories, so I can also tag my posts in Live Writer. In addition, I can post a draft to my blog online and then go to a different machine with Live Writer and work on the post from there. Being able to add my SharePoint Intranet blog as a publishing target is a nice bonus. Plug-ins: Live Writer has a nice plug-in system that allows third-party plug-ins to be developed and made available through http://gallery.live.com. I added a plug-in to let me format code snippets in colour. Plug-in Fixes: Ironically, I tried to insert a sample code snippet above using the two most popular Live Writer code plug-ins, but neither came out properly formatted. Apparently, I need to massage the CSS myself to use these add-ons. 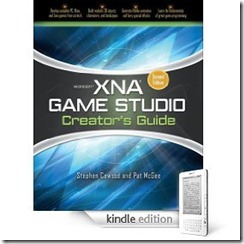 The Microsoft XNA Game Studio Creator's Guide has been doing well in the reviews for the Amazon Kindle edition. - James Anderson "Avid Reader"
While at the Microsoft Professional Developers' conference (#PDC09), I was interviewed by Paul Krill (editor at large at InfoWorld) for an article about Microsoft's cloud computing platform: Windows Azure. Read the Windows Azure article on the InfoWorld website: Can Windows Azure deliver on IT's interest in it? There are already some articles out there about installing SharePoint 2010 Beta 2, so I’m not going to write one from scratch. Instead, I’m going to use the most comprehensive one that I could find and blog about my experience. I did start reading articles about installing the new Beta (some are linked below), but I decided it just wasn’t worth trying to start from scratch. I have other things to do—like taking my cat to the vet. 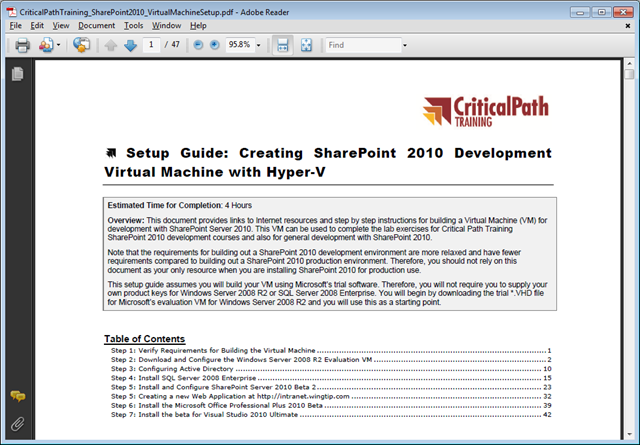 I didn’t have to struggle through the maze of patches and service pack downloads because CriticalPath Training has published a free 47 page installation guide for creating a SharePoint 2010 Beta 2 Hyper-V virtual development machine. One of the best things about this document is that it provides links to all the service packs, hotfixes and cumulative updates that SP 2010 Beta 2 requires. If you’re put off by the weight of 47 pages, don’t worry. 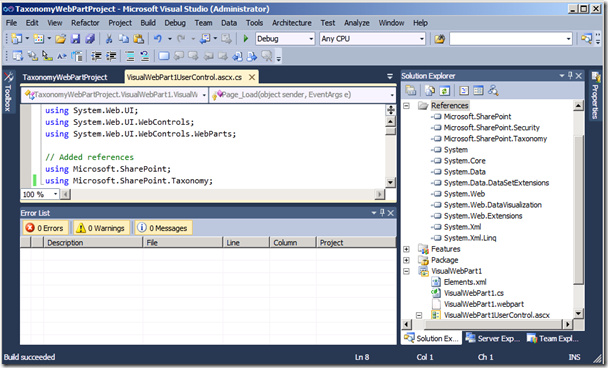 The document also includes the installation of the Office 2010 Beta and Visual Studio 2010 Beta. If you don’t need those, you can skip about 10 pages. You can get the setup guide from the CriticalPath Training website, but you’ll need to register as a member first (also free). After you register, you’ll see a Members link in the top navigation. 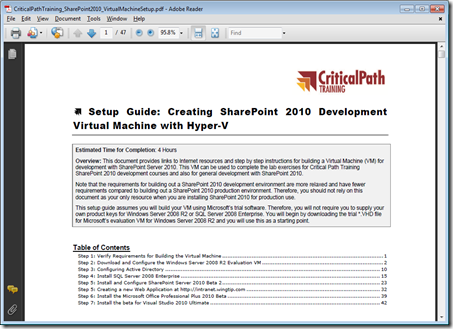 Click Members and the SharePoint Server 2010 Beta 2 Virtual Machine Setup Guide will be in the list of articles. For this install, you’ll need to either copy an existing W2K8 R2 (64bit) Hyper-V image or create a new one. SharePoint 2010 requires a 64bit O/S. It can be installed on Windows Server 2008 or Windows 7 (for dev only). Note: The virtual hard drive needs to start with at least 12GB (just to install the O/S) and at least 15GB (just to install SQL Server). I’m starting with 40GB, so I’ll see how that goes. Remember to activate Windows, run Windows Update, and change the machine name (if you want) before you get too far into the install. 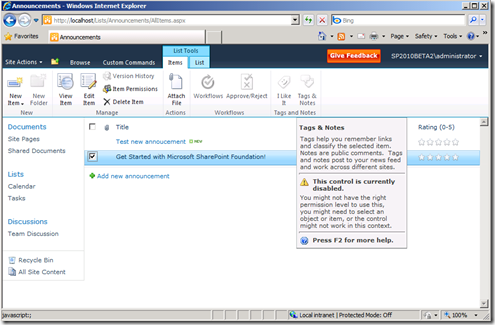 Next, grab the SharePoint 2010 Beta 2 install (either Server or Foundation) from the TechNet site. Note: WSS is now called SharePoint Foundation. Once you have the download and the key is sent to you in e-mail, your can follow the instructions in the CriticalPath Training setup guide. Some of these points may be related to the difference between the public download (the option I chose) and the MSDN subscriber download. 1. Typo: On page 8 DWORD (64-bit) Value should be DWORD (32-bit) Value. 2. SharePoint Server Install: When I got to page 25 and started the actual SharePoint Server install, I didn’t extract the files first and run PrerequisiteInstall.exe as described in the docs. I simply ran the installer. When I was prompted with the screen below, I chose Install software prerequisites. 3. Farm Configuration: I was prompted for a username and password to access the site. I was not initially asked to participate in the feedback program as mentioned in the install guide. However, the Initial Farm Configuration Wizard threw an error. When I refreshed the page, I was asked about submitting error reports and then the wizard continued. 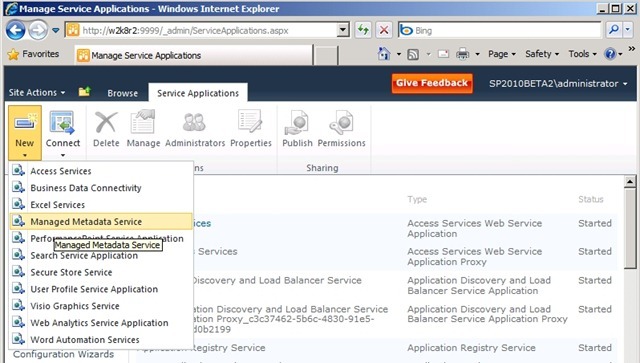 The service application proxy "User Profile Service Application" could not be provisioned because of the following error: The request channel timed out while waiting for a reply after 00:00:19.7128502. 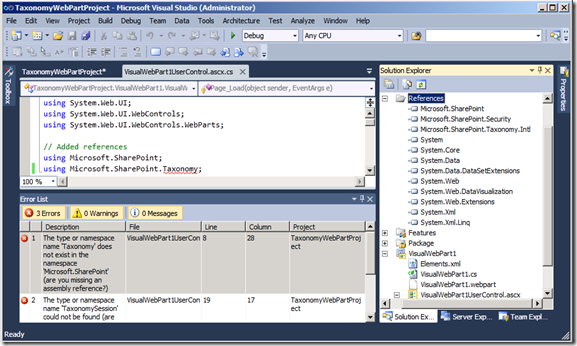 Increase the timeout value passed to the call to Request or increase the SendTimeout value on the Binding. The time allotted to this operation may have been a portion of a longer timeout. This likely happened because I only have about 1.5GB of RAM allocated to the VM. For now, I’m just going to move on and not worry about it. I have another server on order that will allow me to up the RAM to the recommended 4GB. 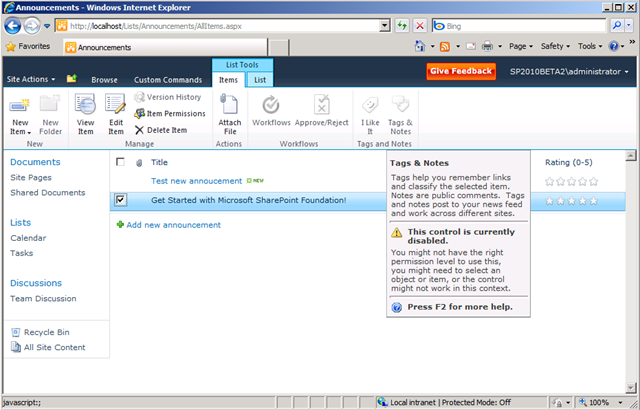 The web application creation confirmation screen reads “SharePoint Foundation” web application has been created. Obviously, Foundation is the platform, but it seems funny to have that wording if Server is installed. 5. Site Collection Creation Typo: The text for the primary Site Collection Administrator on page 36 reads WINGTIP\SP_WorkerProcess, but the screenshot shows WINGTIP\Administrator. The admin account is the correct one. 6. Page 40 Typ0 and getting SharePoint Designer 2010: “SharePoint Designer 201” should obviously be “SharePoint Designer 2010.” The guide seems to imply that SharePoint Designer 2010 Beta is provided with the Office 2010 Beta; this isn’t the case. If you are an MSDN subscriber, you can get the SharePoint Designer 2010 Beta from MSDN. 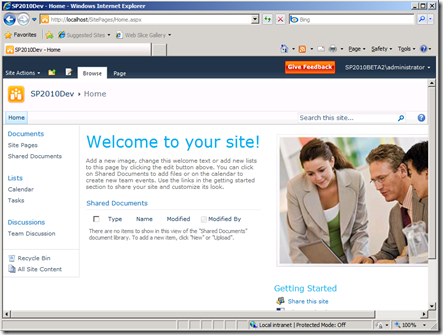 If you’re not a subscriber, you may be able to get a SharePoint Designer 2010 trial download. 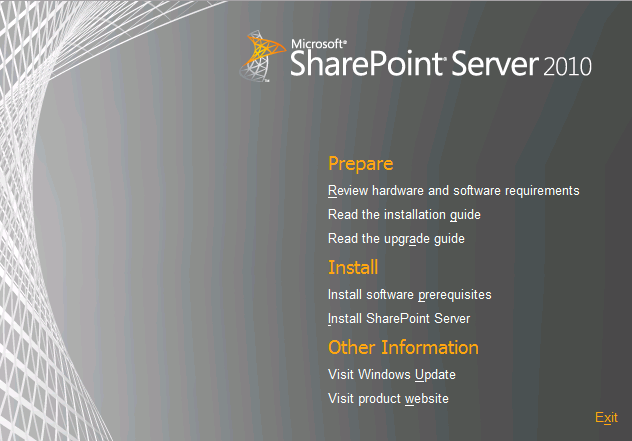 Thanks to the CriticalPath guide, I saved a bunch of time getting SharePoint 2010 Server Beta 2 running. I'm sure there are many people out there who find their incoming e-mail to be difficult to manage, but if you work in software, the deluge can be overwhelming. I've been doing some traveling lately and I'm quite far behind on my bailing. Partly as a reminder to myself, I thought I'd document some of the techniques I use to keep my inbox hoarding to a minimum. I currently have 1042 messages in my inbox and this is how I'm going to cut that down by 100 a day until I get it back to normal (about 40 or so). 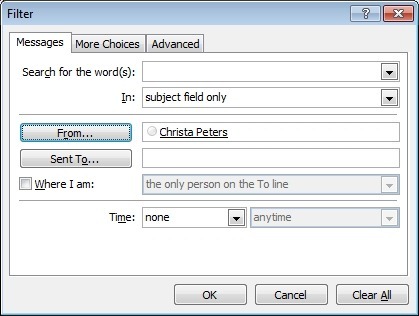 One of the reasons I’m a fan of the Microsoft Outlook client is that it allows for these management techniques. 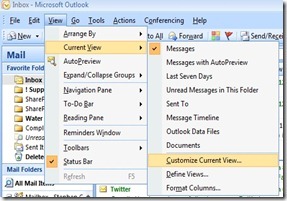 Outlook rules enable you to automatically deal with messages as they arrive. You can access rules by going to Tools > Rules and Alerts. The options for rules are extensive; whether you want to move, delete or forward messages automatically, you’ll find what you need under the rule settings. I use rules to file messages that are sent to distribution lists (DLs) and I’m on, but don’t necessarily have to read right away. I don’t see a lot of people use this option, but colouring messages as they arrive is a good way to identify the messages that need to be dealt with first. My instinct is to go to Rules and Alerts to set this up, but you actually do it by selecting a message from the person (or DL) that you want to colour and choosing View > Current View > Customize Current View. Next, from the Customize View dialog, choose Automatic Formatting > Add. 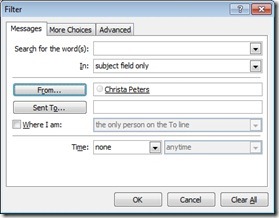 In the Automatic Formatting dialog, choose your conditions and then specify message coming from a particular person (or any other condition from the available options). Once you’ve set the condition, you can apply custom formatting. You could have messages from different people formatted with different fonts, or bold, italics, etc. I like to use colouring to identify messages from my family and Metalogix executives. Note About Size: If the size of your inbox is the most important consideration for you, start by sorting by Size. This will allow you to file or delete the largest messages first. One of the reasons I have issues keeping my inbox tidy is that I use e-mail messages as my daily to-do list. This means that messages could potentially sit around because I’m waiting for the day that I need to take action on them. To prevent this, assign a reminder to the message and then file it into a temporary folder (such as “TODO”). To set a reminder on an e-mail message, right-click the message, choose Follow Up > Add Reminder. Once the custom reminder dialog opens, you can specify when you would like to be reminded of this message. The reminder will pop up just like an appointment, but clicking on it will open the e-mail—very handy. You can use this same technique to assign coloured flags to messages. Although Gmail has come along to claim that folders are unnecessary, I still use them. There are times when I want to look at all the messages related to a topic (e.g., a conference) but I don’t want to rely on search to decide which ones fit my criteria. The Gmail method of doing this is to use labels, but in my mind, if you’re taking the time to do that, you may as well be using folders. Either way, you’re adding metadata to the message and it takes about the same amount of time. I have, however, hit the bar of having too many folders (exactly the problem Gmail avoids) and I have recently started to ‘flatten’ my tree of folders. 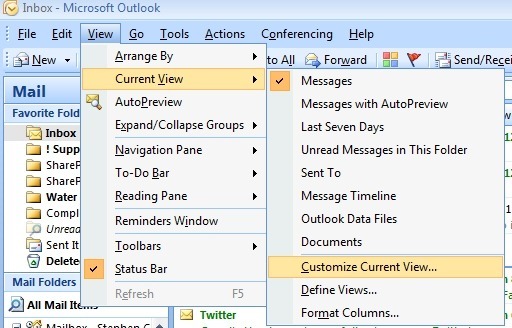 Once your folder tree is under control, it’s a lot easier to drag messages from your inbox to the folder view in Outlook. If you find that a deeply nested folder is being used a lot, you can either move it up the tree or add it to your Outlook favourite folders by simply dragging it into the favourites window. I’ll probably add more points when I think of them. I hope this is somewhat useful to all you e-mail hoarders out there.